The Wallace Secondary Schools' Art Awards 2016. Euan Zhuang, Year 12 Visual Art, has been selected as a finalist for The Wallace Secondary Schools' Art Awards 2016. Euan's work will be exhibited at the Pah Homestead alongside artworks from other secondary students. The presentation evening will be Monday the 12 September (doors open at 5pm). These Awards are given to encourage and develop the visual arts in New Zealand and to highlight artists creating remarkable work. The Exhibition will feature the winning artworks and a selection of finalists and will travel to Wallace Gallery Morrinsville and Pataka Art + Museum. As part of Arts week our senior students enjoyed opportunities to hear how they might progress their skills and interests at tertiary level. Here is a photo of Media Design School representative Ying-Yue Zhao talking to our senior students last week Friday about the digital media courses they provide. Other speakers during the day included ex-Lynfield College student Dan Anderson from Yoobee, and Lianne Saunders from Whitecliffe College of Arts and Design. 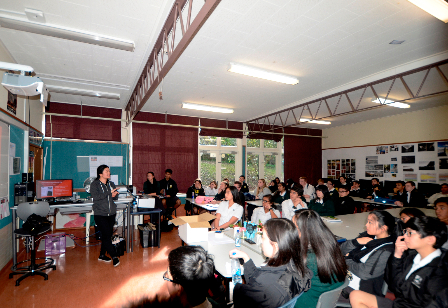 Ex-Lynfield College students Melyssa Banham, Ye-Bin Lee, Jeeeun Koo and Eilish Out-OReiily shared their recent experiences at AUT Design, Auckland University and Elam School of Fine Arts. Our students were particularly interested in learning about the design for gaming, animation and film programmes, as well as how to manage the transition from secondary to tertiary education.